Now life has killed the dream I dreamed"
In the beginning of Fantine's song she talked about men being so kind, and convincing. She talked about how love was blind, the world was a song, but then everything went wrong. To give a background of Fantine, she was in love with a man who she had a child with. Once Fantine had her baby her lover left, and never came back. Fantine worked in a factory to support her daughter who was living with adopted parents. Once people at the factory found out that she had a child with no husband they kicked her out. 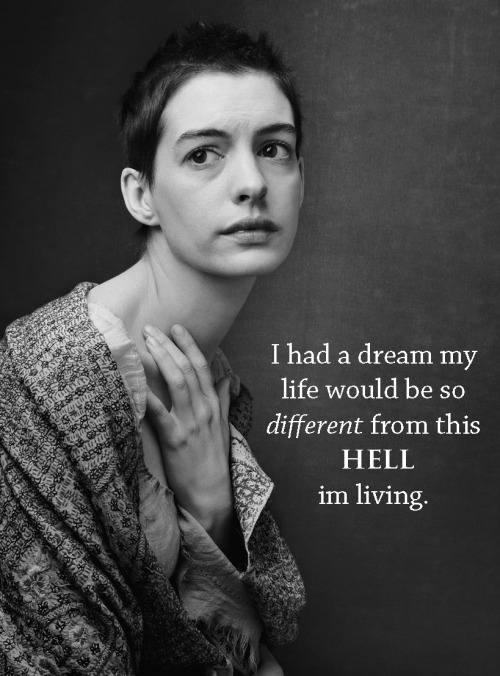 When Fantine was singing this song she had just become a prostitute to make money. The song portrays the double standard in this time. If a man was to loose his job he would be able to support himself no matter what. Women have three choices: work at a factory, get married, or be a prostitute. As Fantine sang the song her emotions were sad, and desperate. I thought that Fantine's emotions about her life and how she felt came out very well in this song. In a way she may have still been living but inside she was already dead. She had to give her life up to provide for her daughter. My favorite lyrics in the song are the last eight lines. The reason I like those lyrics the best is because to me they have a deeper meaning then just my dream is dead. Fantine thought things were perfect when she had a man in her life, but she finally started to realize everything isnt what it seems. By the end of the song I could really see the pain, and the suffering she went through.